Winter is coming to scorch the TV screens as "Game of Thrones" returns for one last time on April 14 with its eighth season. HBO on Monday announced the premiere date of the hit series last installment on its official Twitter account. The network also offered a 90 second-long "offical tease", captioned as: "April 14. #ForTheThrone." 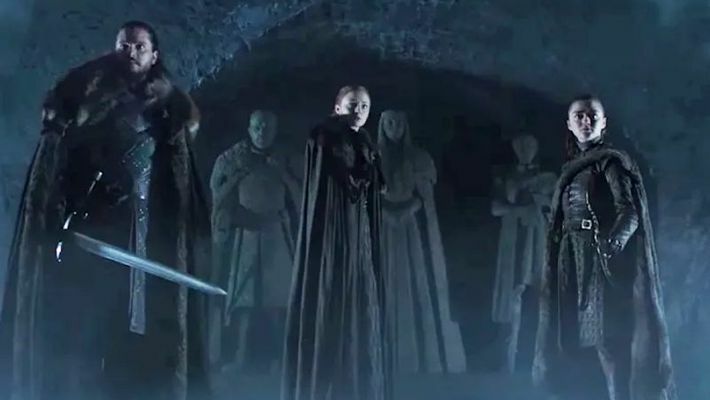 The video clip shows Jon Snow, Sansa and Arya - three members of the Stark family - making their way through the crypts under their family home. The viewer hears messages their from dead family members Ned and Catelyn Stark as well as Lyanna Stark, Ned's sister and the mother Jon never knew. When the troika reaches the crypt's end, they come face-to-face with their own statues. As confusion clouds their faces, a fallen feather starts turning into ice and the crypt fills up with fog, cautioning that the winter is here. Last wee, HBO debuted new footage from the eighth season -- that featured Jon, Sansa and Daenerys Targaryen -- as part of its 2019 line-up. Showrunners David Benioff and DB Weiss, as well as David Nutter and Miguel Sapochnik, will direct episodes. Benioff, Weiss, Bryan Cogman (co-executive producer) and Dave Hill have scripted the episodes. The network announced last November that the show's final season will premiere in April 2019. Season eight has six episodes - each of which could run as long as 90 minutes. The shooting began in October 2017 and wrapped 10 months later.